It may not always be the most simple of tasks to find the perfect outfit for a huge celebration. This is why New look are on hand in The Liberty to help you stand out from the crowd, like Harry and Meghan. We recommend their Royal Wedding Collection allowing you to ‘sparkle like Markle’ with elegant pastel tones and co-ordinating sets. Why not look pretty in pink in the Pink Lace Crochet Trim Bodycon Dress for just £29.99. This laced number is also available in Cream and Pale blue. It’s time to get your dancing shoes on, and what better way than combining comfort with style. 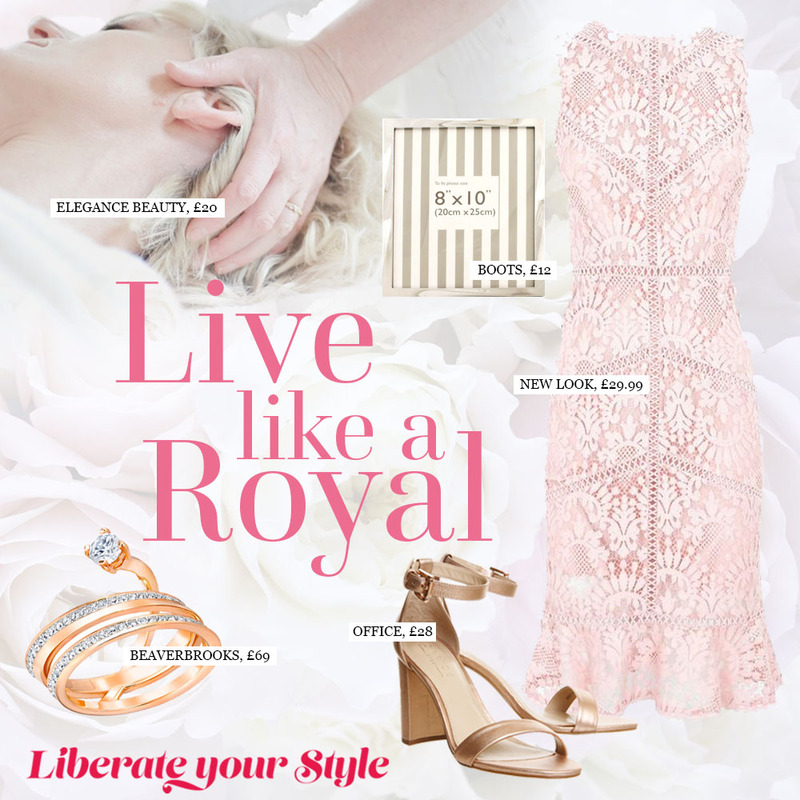 Office in The Liberty is here to tick another important box off your list with on-trend styles from sling-back heels to glamorous sandals set to complete an outfit fit for a Queen (or Dutchess). These Nina Block Heel Sandals in Rose Gold Leather are the perfect fit for a Royal celebration priced at just £28.00. We all know the key to looking glamorous is feeling glamorous. Get that Royal glow we’re all craving by indulging in a spa treatment or two at Elegance Beauty in The Liberty. With a wide range of beauty and spa treatments for both male and females, it has never been easier to prep the skin ahead of a hectic weekend. We recommend the Express Facial for a healthy complexion in just 25 minutes costing £20.00. The highly anticipated first view of the royal wedding ring is always one to tug at the heartstrings and prompt an immediate jewellery-shopping spree. If it’s a treat from me to me that you’re looking for, you’ll get eyes rolling with this Swarovski Fresh Rose Gold Plated Ring for £69. Completed with Swarovski crystals, this ring is guaranteed to glitz up any outfit and make you sparkle. Make memories that will last a lifetime, and what better way to capture a special moment than with a photograph to keep forever. Secure that pride of place spot on the mantle piece with a Twizzle Photo Frame from Boots. At £12 for a 10” x8” frame, this is the perfect elegant masterpiece to remind you of the big day. There’s no other way to prep for a Royal Wedding than with a traditional British cup of tea. When you’ve secured the celebration plans and party frock, don’t worry as Costa, located in Waterstones and Debenhams in The Liberty are ready and waiting to help you relax when you are shopped off your feet.